Fullerton, California’s The Slidebar has partnered with Rob Zombie’s Great American Nightmare to host the Rob Zombie’s Great American Nightmare Battle Of The Bands live local music showcase this September and October. Unsigned talent will have a chance to compete for a chance to play the Monster Energy Main Stage on one night of Rob Zombie’s Great American Nightmare. Rob Zombie’s Great American Nightmare–the ultimate Halloween music and horror event–will be held every Thursday, Friday, Saturday and Sunday from October 10th-November 2nd at FEARPlex in Pomona, just outside Los Angeles. The live music showcase nights for Rob Zombie’s Great American Nightmare Battle Of The Bands will begin with preliminaries at Slidebar on September 9th, 16th, 23rd, and 25th, and will culminate with the four finalists competing on October 6th. One winner will earn the honor of performing on the Monster Energy Main Stage at Rob Zombie’s Great American Nightmare. The performance date for the winning band will be announced at the final battle at Slidebar on October 6th. To enter the competition, bands should email slidebarvenuebooking@yahoo.com by September 13, 2013. Each entry should include: Band Name, Genre, Facebook Page, Twitter, Contact Name, and Contact Email. Bands will be chosen from these entries to perform at the weekly battles, each featuring five bands. Also visit the SlideBLOG at www.SlidebarFullerton.com for more details. Rob Zombie’s Great American Nightmare will feature 15 nights of music, culminating with a November 2nd headlining performance by Rob Zombie himself. This bone-chilling experience will combine the most advanced haunted house attractions with a not-to-be-missed music festival from top artists in the realms of hard rock/metal, rock alternative, EDM, and Latin music. Each Thursday night will feature rock alternative music, Fridays EDM, most Saturdays will feature hard rock/metal, and most Sundays will be Latin music focused. Please visit www.GreatAmericanNightmare.com for the full list of music performances by date. In addition to Rob Zombie, Great American Nightmare music performances will include: 3OH!3, 45 Grave, Andrew W.K., Beware Of Darkness, Blaze Ya Dead Homie, Blood On The Dance Floor, Butcher Babies, DirtyLoud, Dirtyphonics, DJ Bl3nd, Doctor P, Duane Peters, Eagles Of Death Metal, Emilie Autumn, Evol Intent, Fei-Fei, Ghost Town, Goldfinger, HeavyGrinder, Kottonmouth Kings, Metalachi, Mod Sun, Motionless In White, One More Time (Daft Punk Tribute), Ozomatli, Powerman 5000, Reel Big Fish, TSOL, Terravita, The Dickies, The Used, The Vandals, Twiztid, Wallpaper, William Control, and Zomboy. One night will also feature pro-wrestling sensations Lucha Libre USA. A creative collaboration between masters of the macabre Rob Zombie and preeminent haunted house producer Steve Kopelman, the fully immersive haunted house experience will feature three attractions based on Zombie’s own horror films: Lords Of Salem Total Black Out, The Haunted World Of El Superbeasto 3D, and Haunt Of 1,000 Corpses. The Great American Nightmare’s Bloody Boulevard will offer outdoor screenings of classic horror films, a DJ, food vendors, beer, wine and spirits, and much more, with freak show characters roaming throughout the grounds each night. 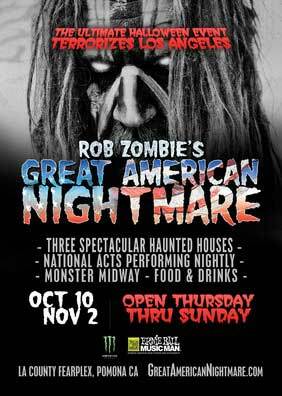 Tickets for Rob Zombie’s Great American Nightmare are available starting at only $30 at www.GreatAmericanNightmare.com Each ticket includes access to all haunted house attractions, concerts and Bloody Boulevard activities. Tickets will also be available for purchase onsite during the Los Angeles County Fair at Pomona Fairplex (August 30th-September 29th). VIP packages are available for purchase at www.GreatAmericanNightmare.com. FEARPlex (Fairplex) is located at 1101 W. McKinley Avenue in Pomona, CA, centrally located in the heart of Southern California. Fairplex is also home to the LA County Fair, the largest county fair in the world.